It’s called “a tradition unlike any other” because it has earned that reputation. The annual rituals and the degree of difficulty bring out the best in the game, with golf immortality on the line from the first tee box to the 18th green, all contested at the most pristine course on Earth. Where else does the reigning champion pick the dinner menu for all competitors the following year? Where else does that same player have to potentially welcome a new member to the gallery of champions, being the one to put the prized green jacket on the next champion if they fail to defend their crown? This year’s Masters is not short on drama, even before the first stroke on Thursday morning. Here’s some background and what to watch for. 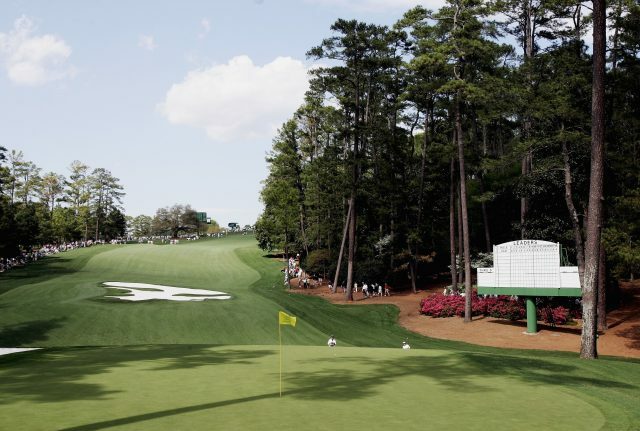 The year’s first major has been played out annually at Augusta National Golf Club since 1934, with the only exceptions being the cancelations of the event between 1943 until 1945 due to World War II. Each hole has a name associated with local plant life, as Augusta was a plant nursery before its co-founding by Georgia’s own Bobby Jones, who would go on to design the course with the assistance of the legendary Alister MacKenzie. The tournament was originally held in the early spring in an attempt to lure sports writers on their way back from Spring Training baseball to stop over and cover the event. Now eighty-five years later, CBS and ESPN pay millions for the broadcast rights to golf’s most celebrated major. Renovations to the hallowed grounds occurred in response to the dominant performances put forth by the modern game’s greatest player, Tiger Woods. Woods captured his first career major and would soon raise questions about the long-term viability of Augusta to stand up to the modern player and the wave of long hitters sure to follow in his wake. By 2001, Tiger had won his second green jacket and completed the “Tiger-Slam,” holding all four major titles at once. Augusta has since moved tees back, added trees, bunkers, and deepened it’s rough to try and slow the big hitters down by creating steep penalties for inaccurate drives. For comparison, the course measured 6,905 yards in 1990 and enters this tournament at 7,768 yards. Longer, narrower, and with pin locations on difficult greens that make even the best players think twice about “going for it”. Sidenote: Woods would win the 2002 tournament anyway, and picked up another Green Jacket in ’05. The Drought: Tiger Woods is always the biggest story in golf. He drives ratings and the all-important casual fan interest meter. When Woods in contention, Nike sells more shirts. He enters these Masters fourteen years removed from his last Green Jacket, nearly eleven from winning a major title. He took the Tour Championship home last fall and looks to be healthy and a legitimate contender since his last top-five finish here in 2013. The Other Drought: Having the unfortunate label of “the next Tiger” has befallen many great tour pros. Maybe none harder than Rory McIlroy. The former world number one ranked player has not won a major championship since the ’14 PGA and has entered Augusta a Green Jacket shy of the “career slam” (winning all four majors in a lifetime) since then. Rory has 5 consecutive top ten finishes at Augusta, and it may be time for him to finally break through and make the trip to Butler Cabin on Sunday evening. SPIETH: The only other player to score -18 in Masters history, Jordan Spieth is on something of a cold streak as well, winless in an event of any kind since claiming the ’17 Open Championship. Golf is HARD. Like McIlroy, much was expected of him when he joined the list of Nicklaus, Woods, and McIlroy as three-time major winners by age 25. Having no victories since this milestone has brought some heat on Jordan, but when your name is alongside the likes of those players, heat is expected. He has never finished outside of the top 11 in his 5 Masters appearances but has fallen victim to one particularly bad hole costing him in a big way since his ’15 win. DJ: Dustin Johnson has suffered some offbeat defeats in his career, having been subjected to some rulings that cost him strokes in Majors, endearing him to fans for handling the controversies with class. Always a threat here, he had to pull out of the ’17 Masters at the last second with a back issue. Top ten finishes in ’15, ’16, and ’18 have many believing the long hitter can close the show this time around. STRATEGY: Augusta National is really built on opportunism. There is no shame in metaphorical “punting” on its difficult Par 3 and 4 holes if left with a suboptimal position on approach or putt. Pars keep you in the game. Making your hay on the Par 5 holes has yielded many champions, and is usually where the field separates, as those were the most affected by the “Tiger Proofing” of this millennium. Be long, be aggressive, make putts. Sounds easy, right? Though left-handed players are uncommon, Augusta is something of a southpaw paradise, seeing Mike Weir, Phil Mickelson, and Bubba Watson win six total times between 2003 and 2014. The design favors the fade shots of left-handed players. Horton Smith won the first Masters in 1934, and two of the first three ever played. He took home a winner’s share of $1,500 each time. Last year, Patrick Reed pocketed 1.9 million for the win. 2011 champion Charl Schwartzel shot a phenomenal -14 in his winning year. The 35-year-old has only finished under par one other time since, a -6, third place finish in ’17. 2007 champion Zach Johnson shot a +1 par in his winning year. He has only finished the tournament under par a single time when he tied for ninth in 2015 at -8.